Your time has come! 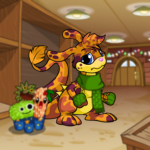 You are meant to save Neopia by becoming a triple avatar pet, and helping all Neopians reach their avatar goals! -- alicebynight, A Savior from Space? Acara Pride: The Top 5! There was only one Acara in all of Neopia that thought that she was more beautiful than Princess Fernypoo, and that was saying quite a lot.